To understand the philosophical tug-of-war over how Connecticut should fund its public schools, look no further than a recent exchange between the governor’s budget chief and the co-chair of the legislature’s Education Committee. The co-chair, Sen. Gayle Slossberg, D-Milford, wanted to know how Gov. Dannel P. Malloy determined in his proposed budget that the state’s primary education grant should send local schools $1.6 billion. “I disagree with the premise of your question,” Barnes responded. Barnes thus put himself at odds with Slossberg and others who believe that the state should provide enough education aid to meet the actual cost – as determined by a study – of providing children with an adequate education. A coalition of educators and municipal leaders suing the state has been asking the state to complete such a study for more than a decade. That Coalition for Justice in Education Funding argues it costs far more to provide an adequate education to students from low-income families than from wealthier ones, and that the state’s current funding setup is falling well short of providing enough so these high-need students get what they require. And with that statement, the Malloy Administration rejected the key request of the plaintiffs in the school-funding lawsuit. 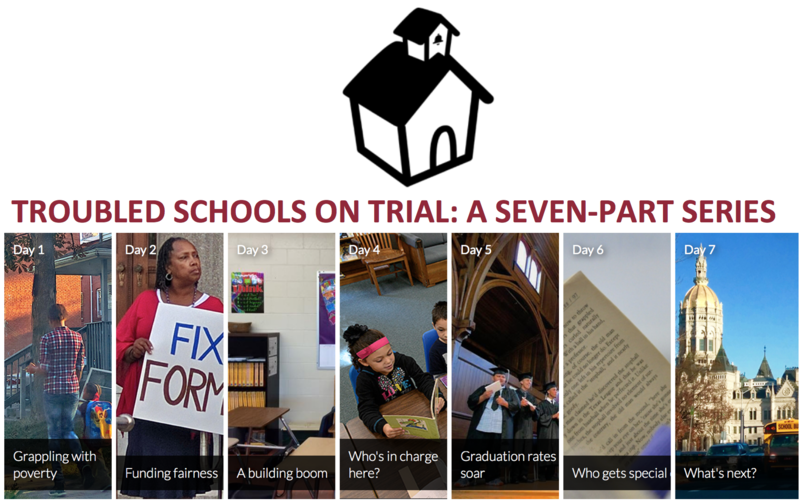 That lawsuit will soon be heard by the Connecticut Supreme Court, following a scathing decision by a Superior Court judge last fall that concluded that the state is spending enough on education overall, but the way it is distributing the aid is irrational. The plaintiffs in the school funding lawsuit estimated the state could do a study of education costs fairly quickly for about $250,000. The coalition has hired experts twice since 2005 to do cost studies like ones conducted in states such as Arkansas, Kansas, Maryland New Mexico and Pennsylvania. The plaintiffs’ most recent study found it would cost Connecticut an additional $1.22 billion to properly fund education for 445,508 students in the 100 school districts that it determined to be under-resourced. That study found that 97,000 students in 66 districts are attending adequately funded schools. Malloy, a Democrat, is proposing instead that the General Assembly level-fund education spending overall, but redistribute that existing pool of money to give more to the most impoverished districts where taxpayers are least capable of raising revenue locally to fund their schools. Malloy’s proposed education aid formula helps ensure districts are able to spend at least $8,990 for each regular education student from state assistance or local revenue. That number is adjusted by factoring in student poverty and town wealth to determine how much the state will send each district. “Is there a rational basis for $8,990 other than the fact that we’ve got a bad budget, we’ve got a pot of money and this is how we’ve divided it up and so we ended up with 8990. Is there an educational basis for 8990 being the foundation level?” Slossberg asked Barnes.